Execute optimal inventory movement through efficient workflows and powerful search and reporting tools. Create commission rules for distributors and reps by product line, hospital, or surgeon—or using any combination. Pay multiple entities on a single case, create threshold rules, support ad hoc bonuses or payouts, and generate commission detail PDFs by rep or sales unit. Initiate purchase and sales transactions in ImplantBase and flow them into QuickBooks without additional data entry. 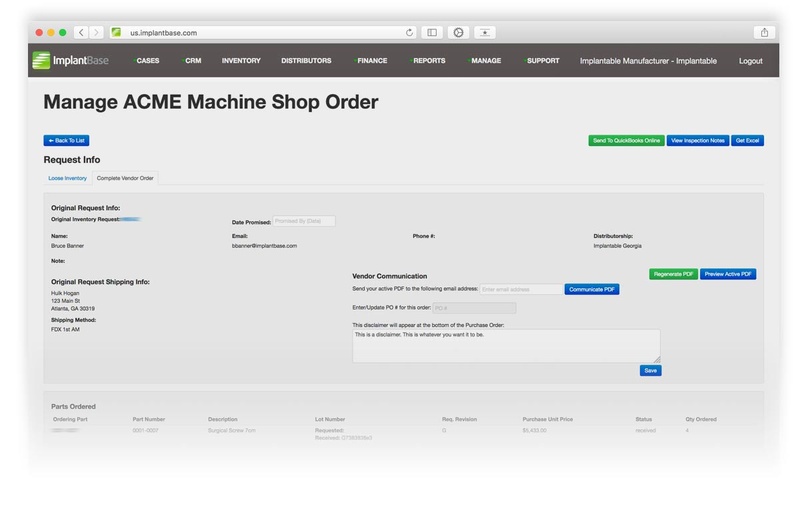 Use configurations to control automatic transaction processing and manual review between systems. Plug and play integration balances inventory and revenue between systems. Gain visibility into every step of the supply chain. 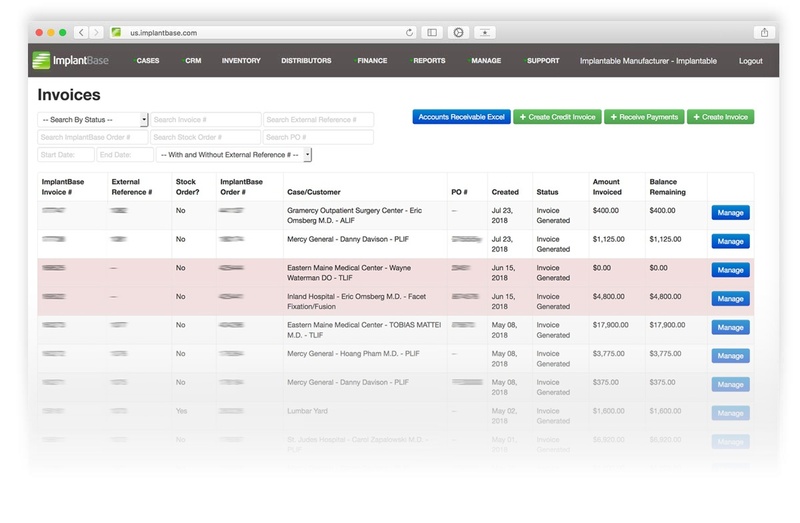 Process commissions quickly and easily, provide transparency, and track all data and activities in a single system. Streamline commissions and contracts. 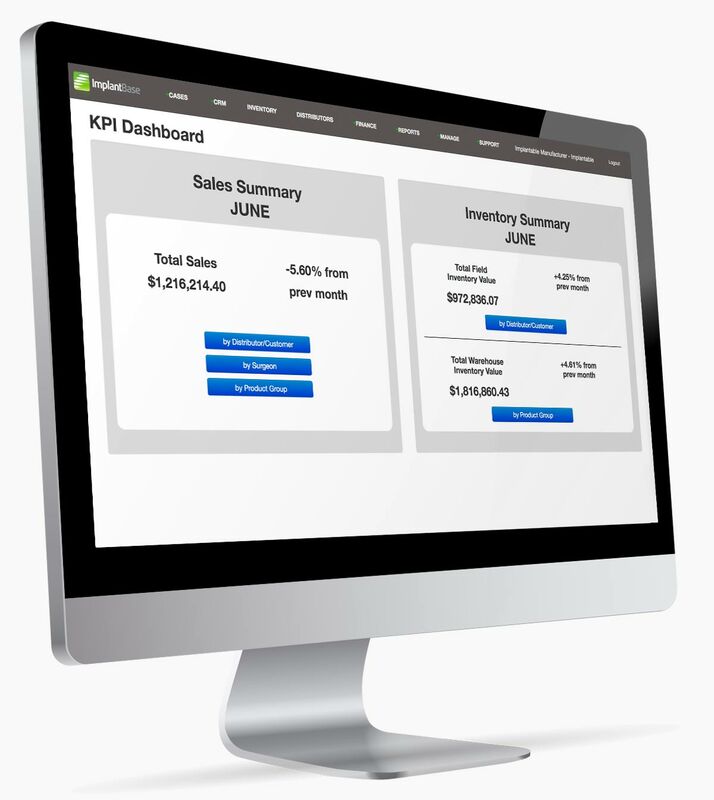 Expand QuickBooks accounting capabilities by making ImplantBase your system of record for detailed inventory data—and delay a costly ERP purchase until revenue exceeds $100M. ImplantBase addresses implant flow issues that can become costly and even paralyzing to organizations. Quite simply… ImplantBase allows our organization the visibility to see where our inventory is, where it should be, and quite often, where it shouldn’t be. Due to the ability of ImplantBase to interface intimately with Quickbooks Online, we can see sales trends, run reports, invoice hospitals, and pay commissions. Comprehensive features to run the financial side of the business. Real-time reporting on all types of sales. Exportable to excel. Real-time reporting on open purchase orders and past purchase orders as well items received (when, by whom, and where allocated). Real-time reporting on write-ons and write-offs, including who executed the transaction, when, and in what context. Real-time reporting on surgeons and stocking distributors sales. Includes trends analysis. Real-time reporting on sales versus average cost of inventory held, by sales unit. Includes trends analysis. Real-time reporting of sales by product type. Includes trends analysis. Create commission rules for most any scenario and generate commissions reports in minutes. Supports threshold rules, bonuses, and ad hoc payments. Follow specific items (or sets of items) through all transactions from initial purchase/receipt to current status for forensic purposes. Send financial transactions automatically (or manually) to QuickBooks to avoid double entry and maintain balance between the systems. Success requires more than just software. It requires extensive know-how, smooth implementation, and dedicated support. That’s why we offer expertise to accelerate your ImplantBase adoption.